(L-R) Julia Rees, deputy representative United Nation's Children's Fund (UNICEF), National Economic and Development Authority (NEDA) Assistant Secretary Carlo Bernardo Abad Santos, Quezon City Vice Mayor Joy Belmonte, Galing Pook Foundation Chairperson Rafael Coscolluela, UNICEF Philippines representative Lotta Sylwander, and Gloria Relova of the Department of Social Welfare and Development (DSWD) during the launching of the Situation Analysis on Children in the Philippines report in Quezon City. 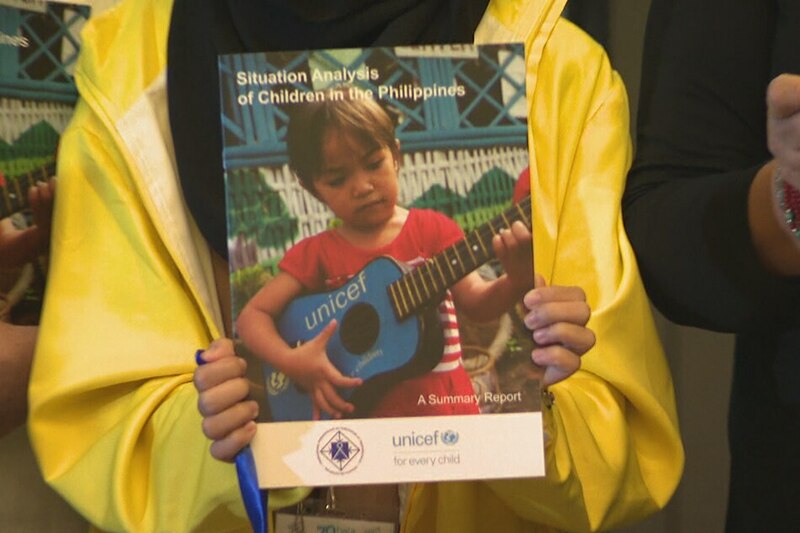 MANILA - A new study on children in the Philippines shows there's still a long way to go in terms of meeting the needs of children in the country, especially kids in Muslim Mindanao. 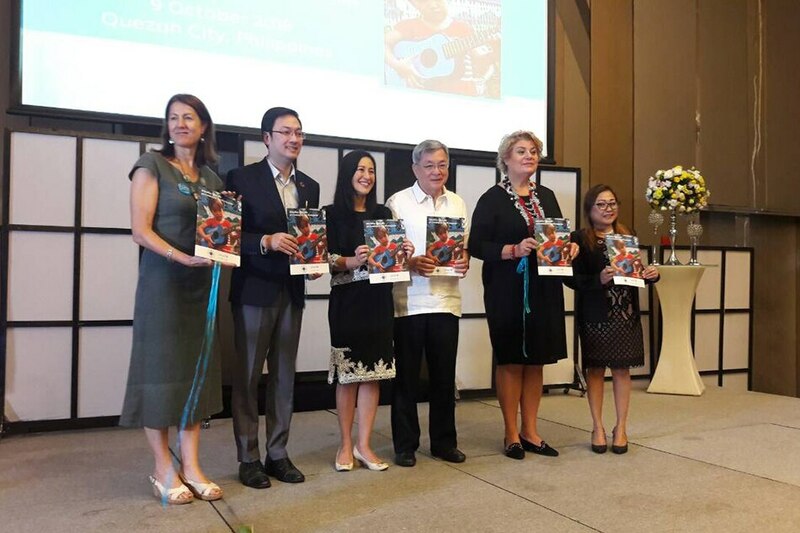 "Majority of Filipinos are already experiencing the effect of better economy, but there are millions of Filipino children who are left behind," said Lotta Sylwander, UNICEF Philippines representative, at the launch of the UNICEF and the Philippine government's study "Situation Analysis of Children in the Philippines," on Tuesday. The report presented the situation of over 40 million Filipino children, basing its analysis on data available in 2017. Social protection, health, nutrition, water, sanitation and hygiene, education and child protection are among the key child rights deprivations identified across sectors in the report. "The results of our analysis show we are still a long way to help give children the best possible start in life," Sylwander said. Findings show that in 2015, 31.4 percent of children lived below the poverty line. The number was double in the Autonomous Region in Muslim Mindanao (ARMM) with 63.1 percent living in poverty in 2015. "That's why it's no surprise that these children often don't get to eat...three full meals a day," Sylwander said. This is also the reason why 1 out of 3 children under the age of 5 was growth-stunted and 21 percent were also underweight. "This is worrisome because not too long ago, we were already seeing these numbers going down but now the trend is being reversed with cases of stunting and childhood wasting actually increasing instead of being reduced," she said. While the Philippines has made notable progress in reducing infant mortality from 41 to 21 per 1,000 live births, and under 5-child mortality from 59 to 27 between 1990 and 2015, it still has to exert more efforts in further achieving the national targets of 15 and 22, respectively. Childhood immunization rates are also low or declining in some cases. "Nationwide, childhood immunizations rates are actually declining in the Philippines, dropping from 89% coverage to 62% coverage in 2015 and it's still declining," she said. She added that access to sexual and reproductive health remains low despite a 230-percent rise in newly diagnosed HIV cases among young people between 2011 and 2015. Teen pregnancy also rose from 49 in 1997 to 59.2 births per 1,000 women aged 15-19 in 2015. Access to clean and safe drinking water is still a problem for many Filipino households, the report showed. Sylwander said that 80 percent of the poorest households (62 percent in ARMM) have access to basic, clean water. Education also continues to be an issue with an estimated 2.85 million Filipino children aged 5-15 out of school. "Even though more parents now enrolled their children to kindergarten, a lot of children still end up dropping out of school altogether," she said. Filipino children are also vulnerable to violence at home, in school, and in the community. "In the first-ever study on prevalence of violence against children, 2 out of 3 Filipino children have, in some points in their lives, experienced physical violence at home and, to some extent, at school," she said. Cyber violence has become a serious threat too as it not only exposes children to cyber-bullying, and many are also at risk to online sexual exploitation. in some cases, children are being coerced by relatives to perform sexual acts for live streaming on the internet. "This is the sad reality. The Philippines continues to be a source, transit and destination country for commercial sexual exploitation and trafficking. In fact, the Philippines has been listed as one of the top 10 countries globally producing sexual content using children," she said. "And this is why 1 out of 4 children aged 13-17 have been victims to online sexual violence." The report recommends a range of measures to address the barriers and causes that prevent children from enjoying their rights. These include creating child-friendly laws and policies that are effectively implemented; increasing government spending for quality social services; improving gathering and use of data on vulnerable groups of children; and, conducting more research on the implications of social norms on children’s rights and promoting positive social norms. Part of the solution, Sylwander said, is making sure that stakeholders create and build a society and culture that is pro-child, where laws and policies should put children’s needs first. "I believe we have the collective power to make a real difference in the lives of Filipino children and to ensure that none of them are deprived of the basic rights, giving them nothing short of the best start in life," she said. Assistant Secretary Carlo Bernardo Abad Santos of NEDA said the report highlights the gaps and challenges in fulfilling the rights of children. "This better informs decision-makers in government and non-government organizations to help them in the conduct of programs that can affect the lives of Filipino children," he said.